Choosing cabinet door styles is one of the more important decisions you will make in your kitchen or bathroom remodel. 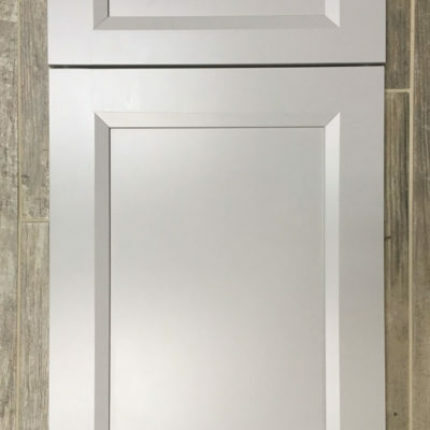 The style of cabinet door drives not only the look and feel of your space, but also it's functionality and the overall budget for your project. To help you make the best choice for your kitchen or bathroom it’s important to understand how the cabinet doors are constructed and the common terminology we use when describing cabinet doors. This bit of knowledge will make the process of selecting your kitchen cabinet doors faster and much less overwhelming. Flat panel Doors: A flat panel door consists of a 4-sided frame with a recessed center panel which gives the appearance of a picture frame. Flat panel doors can be very simple like a shaker door or have a small amount of detail on the inside edge. The doors can be constructed with mitered corners or mortise and tenon corners (visit our cabinet construction page for more details). Turn the door around and look; a higher quality door will have a thicker, center panel. This thicker panel helps with the stability of the door and reduces the noise when you open and close it. If you plan to use a paint or opaque stain on the door, mitered corners are discouraged. Mitered corners are more susceptible to separation with humidity fluctuations which become very obvious with these finishes. Historically the simplicity of the flat panel design resulted in a lower price point, but designs with a reversed raised panel for the center panel in some of the higher quality cabinet lines blurred that hard & fast rule. Raised panel: A raised panel door consists of a 4-sided frame with a raised center panel which can have molding or varied edge details providing a more interesting profile compared to the simpler flat panel doors. For a more custom look, the raised center panel can come in varied shapes like square, arched, cathedral, etc. The doors can be constructed with mitered corners or mortise and tenon corners. (visit our cabinet construction page for more details). A higher quality door will have a thicker, center panel. This thicker panel helps with the stability of the door and reduces the noise when you open and close it. The more complex the design, the more costly the door. Slab: Also known as a solid panel door, the slab door is the simplest of all the doors styles. This door looks like a flat solid plank of wood without raised or recessed panels or frames of any kind. Despite the appearance of a single piece of wood, slab doors are constructed from multiple pieces of solid wood or an MDF inner core to avoid the tendency of a solid piece of wood to warp. Many slab doors are finished with a veneer which can be made of wood, laminate or foil. Solid panel doors can have different edge details which vary greatly in price point. As a rule of thumb, if it is an uncommon finish or uncommon wood species, it’s probably expensive! Accent & Mullion: Although cabinet manufacturers will use different terms for these kinds of doors, they are most frequently referred to as accent or mullion doors. Strictly speaking, in architectural terms the mullion is the vertical design element used to create a pattern on a door or window. In the great big world of kitchen cabinets, many manufacturers use the term mullion to designate that the door has a pattern in the center that you can insert glass or other materials behind. There are many different styles of mullions. They can be X lattice, curved, standard grid, shaker grid, gothic arched, and so on. The terminology is usually specific to each manufacturer. There can be significant price differences in the choices of accents & mullions so it is important to discuss these features with your designer to ensure your selections fall in your budget. Framed Glass Door: A simpler alternative to a mullion door, a framed glass door is constructed without a center panel. The door is prepped for glass and has no mullion. By removing the center panel it allows you to insert the material of your choice. Wood shelves can sometimes interfere with the pattern on a mullion door. For a simpler less busy look you might opt for a framed glass door instead. Inserting a mirror, stained glass, or leaded glass can be a great alternative to clear glass. Louvered Door: Louvered doors are constructed with horizontally positioned wood slats within the frame of the door. They are typically used to create a very distinct design feature or to give ventilation to things such as audio equipment, dryers and radiators.